We know that managing soil organic carbon can help mitigate climate change and support food production. The challenge is whether actions can be taken at large enough scales and quickly enough to matter. In a commentary published in Nature this week, scientists advising the “4 per 1000 Initiative: Soils for Food Security and Climate” called for action to enable large-scale management of soil carbon. 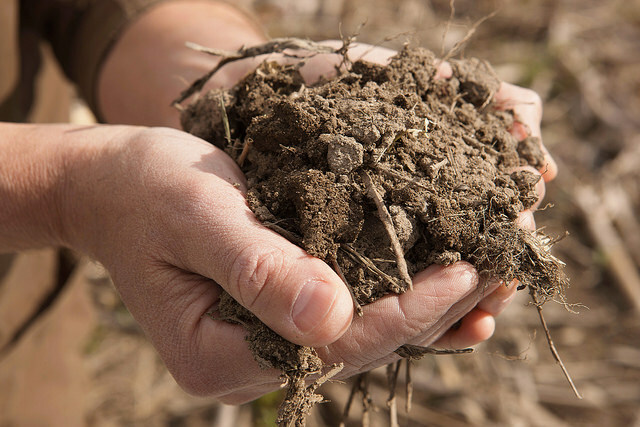 They recommended increasing global soil carbon by protecting existing carbon in peatlands and forests, restoring degraded lands, and supporting farmers to use best practices on current agricultural lands. 1. Improved methods to track and evaluate interventions with science-based harmonized protocols and standards, including high-tech remote sensing and other spectroscopy tools for faster, cheaper and more accurate monitoring of soil carbon changes. 2. Improved understanding of what works under different local conditions, using modelling and a global network of field sites. An open data platform would enable wide, rapid information-sharing. 3. Policies on soil and climate in the United Nations Framework Convention on Climate Change (UNFCCC) and at the national level to provide technical assistance and incentives to farmers and monitoring systems to track and validate progress.